Top pro-Israel groups in America are mobilizing against Sen. Rand Paul (R., Ky.) for blocking the continuation of U.S. aid to Israel, the renewal of which comes at a critical time for the Jewish state as it continues to combat ongoing terror attacks from Hamas loyalists along its border. The American Israel Public Affairs Committee, or AIPAC, the nation's foremost pro-Israel lobby group, has been purchasing advertisements on Facebook outing Paul as the primary Senate force blocking the reauthorization of the U.S.-Israel security pact, according to sources close to the effort. Other prominent pro-Israel organizations, such as Christians United for Israel, or CUFI, also have undertaken efforts to expose Paul's hold on U.S. security assistance to Israel, recently organizing an email blitz aimed at pressuring the isolationist senator to remove his hold on the critical funding bill. CUFI is said to have invested heavily in ads based in Kentucky to target the senator's constituents directly on the issue. Paul, a proponent of ending U.S. aid across the globe, has had multiple confrontations with the pro-Israel community over the years as result of his views. Paul has sought to hold up U.S. aid to Israel multiple times over the years, creating friction between him and top U.S. pro-Israel lobbying shops. 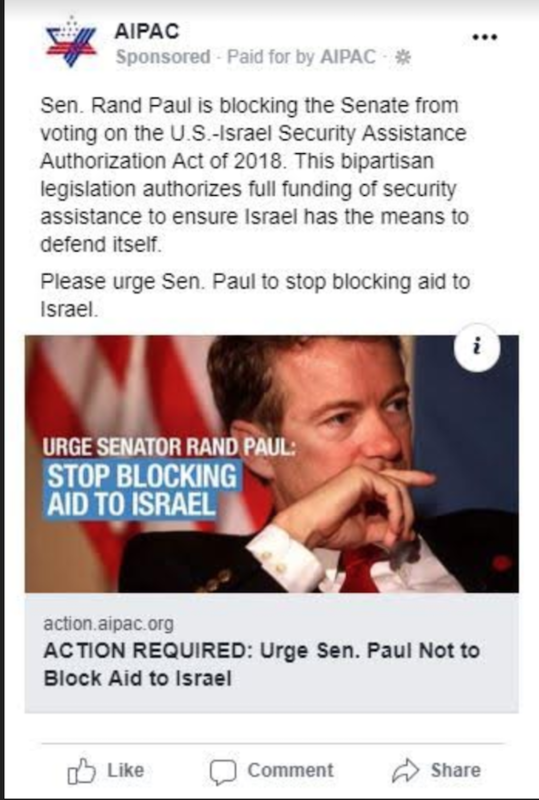 "Sen. Rand Paul is blocking the U.S.-Israel Security Assistance Authorization Act, S.2497," CUFI wrote in a Monday morning email "action alert" to its millions of supporters across the country, including Paul's home state of Kentucky. "This bill is the cornerstone of U.S. support for Israel. It ensures Israel has what it needs to fight terrorists like Hamas and Hezbollah, and keeps at bay tyrants like the leaders of the Islamic Republic of Iran." "Sen. Paul is blocking this important legislation," CUFI wrote. "The bill, which already passed the Senate once, and then the House of Representatives, is expected to be enthusiastically signed by Pres. Donald Trump. Our last obstacle to getting this bill signed into law is Sen. Paul's hold in the Senate." Paul's efforts to block the continuation of U.S. aid to Israel also has drawn the attention of AIPAC, the nation's most formidable pro-Israel organization. The group has already been running advertisements of Facebook outing Paul as the source of the hold and urging its supporters to contact the senator to express opposition to his effort. One official at a pro-Israel organization who spoke to the Washington Free Beacon said that Paul's hold is not surprising, but remains "inexplicable" at a time when Israel is facing one of the worst terrorist barrages in recent memory, as well as growing threats from Iran and its terror-proxy Hezbollah. "Given the overwhelming bipartisan support that has been shown for this legislation, this resistance is inexplicable," the official said. "This is hardly the time to hold back support for our ally in view of the immediate terrorist threats it faces from Hamas, Hezbollah, and Iran." 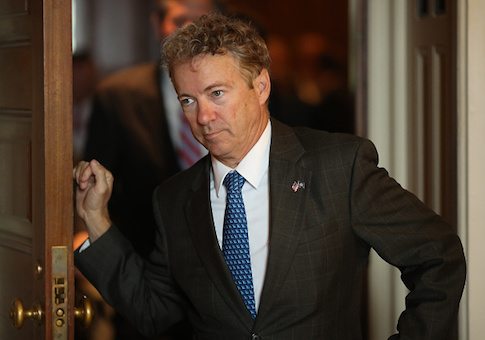 Pro-Israel congressional allies on Capitol Hill also are expressing frustration with Paul. Senate rules maintain that only one senator is necessary to perform a hold on legislation such as the U.S.-Israel security assistance package. "Rand Paul is against sanctions on Iran and Russia, but he wants to block assistance to Israel and Saudi Arabia," said one senior GOP congressional official who spoke to the Free Beacon. "When Republicans hear that, they don't hear the sound of a principled conservative who avoids foreign affairs. That just sounds like a guy who's on the wrong side." Paul has been at the center of GOP congressional frustrations in recent months, pushing a measure to suspend U.S. arms sales to Saudi Arabia and its military coalition partner Bahrain as they battle pro-Iran militants in Yemen. That effort was opposed by the Trump administration and congressional allies who argued that Iran's malign activities must be stymied. While Paul has placed a hold on the U.S.-Israel security assistance package in the past, there have been times when he has agreed to let it pass without issue, fueling speculation about why he has chosen this moment to again oppose the funding measure. CUFI Action Fund Chairwoman Sandra Parker told the Free Beacon that Paul is blocking the will of the vast majority of Americans, including those in Kentucky, who support the U.S.-Israel alliance. "Sen. Paul needs to remove his hold from this bill without delay," Parker said. "The ill-advised foreign policy views of one senator should not be allowed to hold hostage such vital and noncontroversial legislation." Sen. Paul's office did not immediately respond to a request for comment. This entry was posted in National Security and tagged Israel, Rand Paul. Bookmark the permalink.